Distilled vinegar and apple cider vinegar are made the same way, but use different starting ingredients. This results in differences in flavor and nutrition, which can mean one type is better than the other for certain uses. Both types of vinegar may have some health benefits, but the research is still preliminary on this issue. Check with your doctor before using vinegar in greater amounts than those typically used in cooking to make sure it's safe for you. To make vinegar, the starting ingredient is diluted and a bacteria called Acetobacter aceti is added to cause the fermentation process that turns it into vinegar. Distilled vinegar is often made by fermenting grain alcohol or ethyl alcohol, and tends to be very high in acetic acid, while apple cider vinegar is made by fermenting apple cider, as the name suggests. Apple cider vinegar contains citric acid, formic acid, malic acid, lactic acid and succinic acid as well as acetic acid. Because apple cider vinegar is made with apples, it also contains multiple types of antioxidants called polyphenols which can have beneficial effects on health. Apple cider vinegar is slightly higher in vitamins and minerals than distilled vinegar, but for this to make a real nutritional difference you'd have to be using vinegar in large amounts. A tablespoon of either vinegar has about 3 calories and won't provide you with any essential vitamin in significant amounts. You'd have to use almost a cup of apple cider vinegar to get a significant amount of any nutrient, as this amount provides 12 percent of the daily value for the mineral manganese, but still just trace amounts of any other essential nutrients. Apple cider vinegar may help slow down the emptying of your stomach after meals, which could help you feel full for longer and limit increases in blood sugar, according to a 2007 study published in BMC Gastroenterology. A review article published in the Journal of Food Science in May 2014 notes that the acetic acid in vinegar may be responsible for the potential anti-diabetic and anti-obesity effects of vinegar, meaning that distilled vinegar may be beneficial for these purposes as well because of its acetic acid content. An animal study, published in the Pakistan Journal of Biological Sciences in 2008, found that apple cider vinegar may help decrease triglycerides and low-density lipoprotein, or "bad" cholesterol, while increasing high-density lipoprotein, or "good" cholesterol. Further research is necessary to determine whether it has the same effect in people. Rinsing leafy greens with vinegar may help get rid of substances such as E. coli, which can cause food-borne illnesses, notes an abstract on the International Association for Food Protection website. Vinegar with higher concentrations of acetic acid, such as distilled vinegar, tend to reduce these organisms more than those with lower concentrations of acetic acid. Vinegar can be used for making vinaigrette salad dressings, pickles, mustard, sweet and sour dressings, marinades and sauces. Using vinegar in marinades helps make the meat more tender. Apple cider vinegar has a very mild, slightly apple flavor, and can be used in place of almost any type of vinegar in recipes. Distilled white vinegar, however, has a very harsh and sour flavor, so it can be overpowering in many dishes and shouldn't be used as a substitute for the milder vinegar often called for in recipes. Distilled vinegar is commonly used for pickle recipes, but apple cider vinegar can also be used for this purpose as long as you don't mind it making the color of the fruit or vegetable darker. 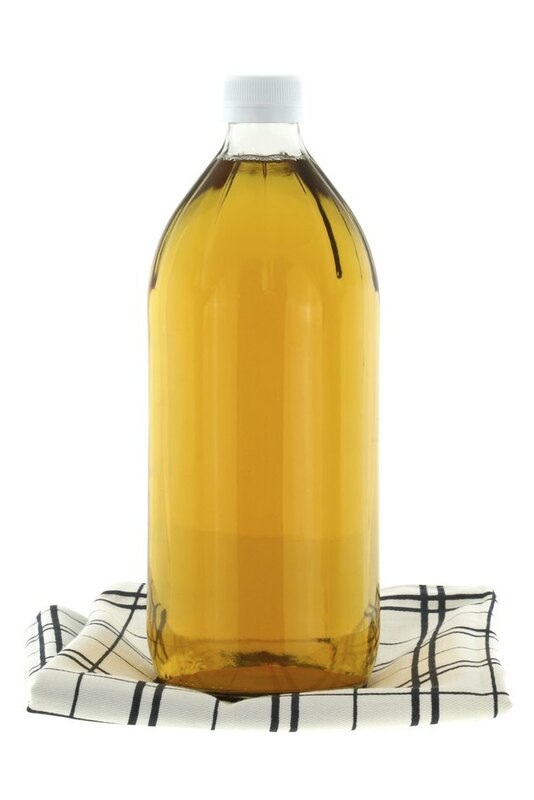 If you use apple cider vinegar in place of distilled vinegar when making vinaigrette, you can increase the ratio of vinegar to oil to decrease the total calories in the dressing. Better Homes and Gardens: If a Recipe Calls for One Kind of Vinegar, Can I Use Another Kind of Vinegar?